The best way to get to know a community is by scheduling a tour. See the facilities, meet the staff and residents, and get a feel first hand what it's like to live at Woodlands Assisted Living Assisted Living. 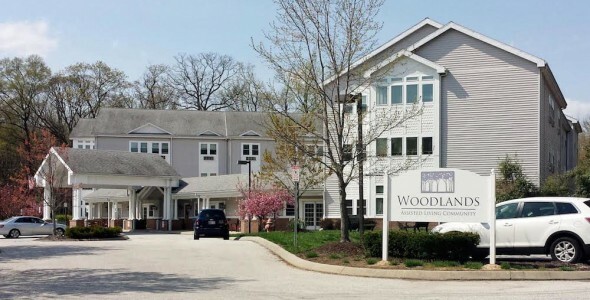 Come home to Woodlands Assisted Living, conveniently located in Baltimore, Maryland, situated near both local shopping and health care providers. Our goal is to enable your independence so you can enjoy your golden years. You will find a host of activities, amenities and all the support services you need to live life to its fullest when you join our community. Woodlands Assisted Living is managed by Chancellor Health Care. We were founded to develop, acquire and manage senior living communities and since 1992 we have made it our goal to provide exceptional care for our residents. Our staff is committed to continuous quality improvement and you will see that in the caring attention you or your loved one receives. Residents at Woodlands Assisted Living don't need to worry about chores or home maintenance. We will take care of the grounds and maintenance, housekeeping and laundry, leaving you free to enjoy time as you please. Whether you want to relax in the library with a good book, enjoy the sun on an afternoon stroll through the garden or partake in group activities with friends, you will find plenty to do. Some of the planned activities we offer include professional entertainment, games, contests and community outings. Our communities offer a number of charming apartments to choose from, including cozy studios to one- and spacious two-bedroom apartments. Apartments include kitchenettes, an emergency call system, large windows and walk-in showers. Three delicious meals are prepared daily and we offer options for those on restricted diets. For your convenience all of these features, including utilities, are bundled into one simple monthly fee. You can expect both safety and security from us. Our caregivers are available to assist when you need help, but you are free to pursue your own interests as you choose. We are able to assist with activities of daily living and assist with managing medications. You will find that our memory care communities are a good fit for those who suffer from Alzheimer's or similar dementias. Our trained staff members know to watch for cues from residents indicating boredom or frustration and work to find stimulating and engaging activities throughout the day. For example, tasks like helping with dinner, gardening or puzzles and games can help to keep your loved one engaged and connected. We welcome you to visit us at Woodlands Assisted Living where you will find a warm and inviting home.